The second edition of a highly acclaimed handbook and ready reference. Unmatched in its breadth and quality, around 100 specialists from all over the world share their up-to-date expertise and experiences, including hundreds of protocols, complete with explanations, and hitherto unpublished troubleshooting hints. They cover all modern techniques for the handling, analysis and modification of RNAs and their complexes with proteins. Throughout, they bear the practising bench scientist in mind, providing quick and reliable access to a plethora of solutions for practical questions of RNA research, ranging from simple to highly complex. 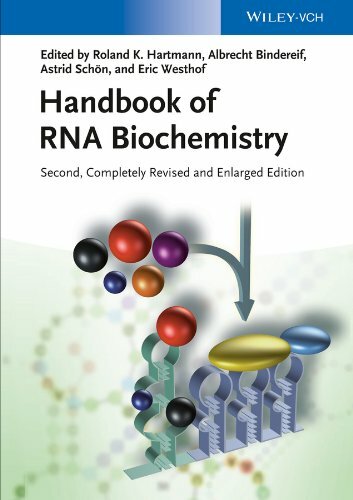 This broad scope allows the treatment of specialized methods side by side with basic biochemical techniques, making the book a real treasure trove for every researcher experimenting with RNA. Roland K. Hartmann is Professor of Pharmaceutical Chemistry at the Philipps-Universitat Marburg (Germany). He studied Biochemistry at the Freie Universitat Berlin where in 1988 he received the Ernst Reuter award for outstanding PhD theses. His research interests include comparative mechanistic studies of ribozyme-based versus protein-only RNase P enzymes, inhibitors of bacterial RNase P, regulation of bacterial RNA polymerase by 6S RNAs, viral RNA-protein interactions, RNA interference and cancer. Albrecht Bindereif is Professor of Biochemistry at the University of Giessen (Germany). He studied Biochemistry in Tubingen and at the University of California, Berkeley. His postdoctoral work was done in Michael Green's laboratory at Harvard University. His research interests focus on the mechanism and regulation of mRNA splicing, both in the mammalian system and in trypanosomes. Astrid Schon is a Senior Researcher and Lecturer at the Department of Molecular Cell Therapy, University of Leipzig Medical School (Germany). She received her PhD from the Institute of Biochemistry at the University of Wurzburg, and was a graduate fellow and postdoctoral associate with Dieter Soll at Yale University. Her research is focused on RNA function and metabolism, RNAprotein interactions, and the evolution of complex RNA enzymes in eukaryotic organelles. Eric Westhof is Professor of Structural Biology at the Universite de Strasbourg (France). He studied in Liege and Regensburg and was a Fulbright-Hays Research Fellow at the University of Wisconsin with M. Sundaralingam. He is a member of the Deutsche Akademie der Wissenschaften Leopoldina and of the French Academie des Sciences. His research is centered on the relationships between sequence, structure, evolution and function of RNA molecules.